The Institute welcomes the publication of A Land Use Strategy for Scotland 2016 – 2021, in which the Scottish Government emphasises the importance of integrated land management that promotes sustainability. The Scottish Government ran a consultation in January, to which ICF responded with members’ feedback. We stressed the vital role of forestry in delivering the Vision, Objectives and Principles of the Land Use Strategy in rural and urban Scotland. We are pleased that this is acknowledged in Policy 4 of the document. The Institute particularly welcomes the fact that the Scottish Government aims to work with in collaboration with industry to consider the opportunities available to land managers to combine traditional upland agri-land uses with woodland/forestry. We note that there will be a review of the Scottish Forestry Strategy, which will hopefully further emphasise the range of economic, social and environmental benefits that Scotland’s forests and woodlands provide. The Institute will ensure that the views of the sector are articulated to the Scottish Government and the Forestry Commission Scotland. The Institute would be delighted to hear your views – please tweet us @TheICF. ICF Members can read the Institute’s response to the consultation on the Members’ Area. 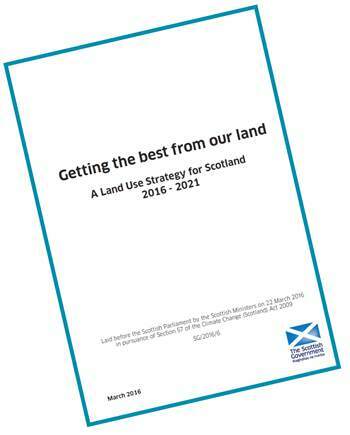 The Land Use Strategy for Scotland 2016 – 2021 can be found on the Scottish Government website.